This one is an amazing table top that motivates you to stay calm and casual in all situations. 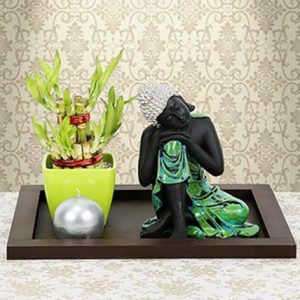 A tray containing a tranquil Lord Buddha statue, a lucky bamboo plant, and a round silver colored candle would be a perfect gift for your office workers in any occasion especially New Year. So, go for it!